Burly Men at Sea follows a trio of fisherman who shake off their mundane routine in search of adventure, these strapping Sailors sporting impressively strong beards have personalities that match their names like the classic brothers Grimm tale – Snow White. A comparison to a fairly tale draws an accurate image, you set off in search of this adventure after discovering a mysteriously blank sea chart washed up in a bottle and after meeting a mysterious old man are inspired to fill out the map with your own adventures. Almost immediately things turn whacky and you stumble upon a series of far fetched and often comical scenarios, after seemingly completing your travels and arriving back to your village you realise that this is just your first voyage. In this interactive novel meets point and click adventure you step into a fairly tale with each short play through, that is never deep and doesn’t give us any backstory, the magic here is in the lighthearted discovery and excellent and often witty writing. Burly Men at Sea uses audio inspired by its Nordic setting, each adventure includes eerie music subtley to create a sense of mystery and exploration. At times the music picks up and is cheery, providing you with a feeling that this adventure is going well and egging you on to explore. At others it takes a slightly more sinister tone where you encounter trouble. On top of the background music the game uses a lot of charming sound effects, mostly these are a voice recorded sound mimicking the real thing – for example the chink, chink, chink of a blacksmith’s hammer hitting his anvil or a woosh as the wind picks up. These made me smile, recounting the feeling of someone reading a story and making a sound effect as you might do when reading to a child. Some variation of pitch would have been a good idea as the background repetition of a single, non modulating sound could cause a little irritation eventually. In keeping with the story telling theme the visuals of Burly Men at Sea look a lot like pages of a fairytale book. The game is designed using heavily vectored graphics that are bold and yet simple with minimalistic detail and strong use of open and blank spaces. The game uses subtlety really well, for example as you traverse the ocean the sky will slowly bleed into a darker shade and your characters colouring will change to become a silhouette representing nighttime. The game was definitely made with an artistic touch and a lot of the interactions in the game have you sit back and watch, the change of setting is often used cleverly – for example when leaving the whales mouth you don’t quite know when the whale ends and the sea begins, it’s cleverly done. One issue with all of this subtlety is at times you can be unsure when you are supposed to interact or just sit back and watch something unfold. It also makes animations look very basic and a little off. From a performance perspective the game ran very smoothly whether on the move or in front of your tv. Some won’t like the low fidelity graphics but personally I appreciate the uniqueness and clearly a lot of thought and effort has gone into the visual design. 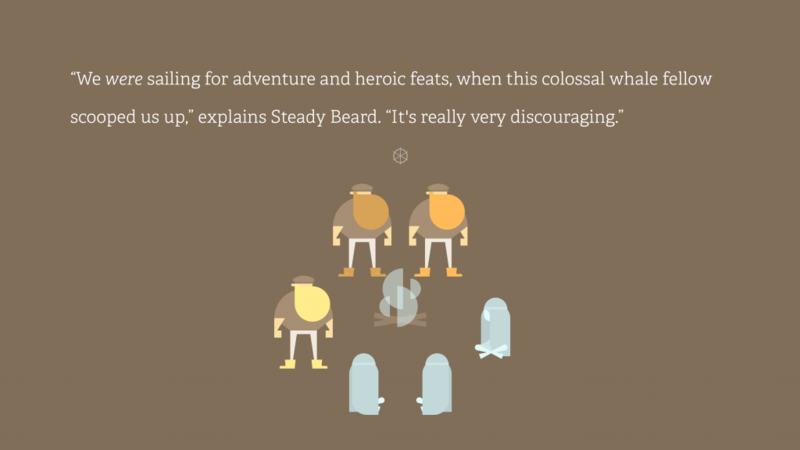 Burly Men at Sea is largely an interactive story with very light gameplay elements. The game was intended for mobiles initially with a simple, yet novel way of moving around – you are able to move a circular viewport left and right, extending the viewport moves your trio in that direction and uncovers the land underneath. Many of the worlds objects can be interacted with – for example you can tap a bird and it will fly away or whack a piece of bread and watch it deflate. Some of these will be required to progress the story such as entering doors or clicking on some simple puzzle style solutions but these are never taxing and no skill is required. At times you can find yourself a little lost as to what to do due to the minimalist art and simplistic gameplay but often I found this was my brain overcomplicating things, usually the solution was simply to move in a direction or tap something on screen. Interestingly we have a few ways to play Burly Men at Sea on the Switch. Using a control pad you can play the game in a point and click style using the right analogue stick to move a reticle and B to interact with an item, this option works OK but its a little bit slow and doesn’t feel very intuitive. Our second option is interesting, you can use a single JoyCon pointed towards the Switch as a wand style device reminiscent of a Wii game using ZL to interact with whatever you are pointing. I found this an interesting way to play when docked but eventually the aim would fall out of sync and I would have to press Z fairly often to recalibrate, detracting from the experience. The third option was my preference, using the touch screen. This felt like the way Burly Men at Sea was intended to be played and enjoyed dragging my finger across the screen left or right. Overall the gameplay is minimalistic here as you would expect from this type of game, there are no make or break clicks to be made with timing and no other game essentials such as life and death are present. At $9.99 in the US and £8.99 in the UK the game is priced at the same point as other console releases, something I am pleased to see considering the additional development of Gyro controls using the JoyCon. That said the game is $4.99 on mobiles which is a significant difference. The game does offer a lot of replay ability after the initial 40 minute or so play through, it is encouraged and intended to be played as a short single sitting story that you can revisit and head out for another voyage when you fancy it. The gameplay elements are very light so for me whether you realise the value is largely going to depend on whether or not you have fallen in love with the tale and experience of playing this light touch, interactive novel with point and click influences. Summary Burly Men at Sea is a magical nordic fairytale adventure with plenty of charm and a slathering of wit, it has some rough edges and the short play throughs and light touch gameplay won't be for every one but if you enjoy a good tale and a laugh you will likely enjoy this unique game.